Unless you’re talking about football or scoring the last Furby from Wal-Mart’s dusty shelf at midnight, you don’t usually hear the words Thanksgiving and victory in the same sentence. I imagine Thanksgiving is like a circle of Dante’s Inferno to a young boy with autism; hordes of out-of-town guests, people pushing things like shrimp and cheese spread at you all day, the offensive smells of roasted vegetables and turkey brine. Whenever we host a holiday, Jack hides from all of his cousins in one of the bedrooms and listen to his music all day. He usually eats with his younger siblings at the kitchen island and bolts back upstairs as soon as he’s done. In the spirit of competition, we decided to name our turkeys. I ignored Joe’s suggestions of “Runner Up” or “Sore Loser”, and settled on Felix. I don’t really remember what Joe named his—for the purpose of this story we’ll just call it Tasteless. Around noon I took Felix out of his brine and lovingly patted him down like a newborn fresh from a bubbly bath. I massaged his tender skin with butter and salt and stuffed him with fresh lemon and garlic and rosemary. Joe and I both started cooking our birds at exactly 2:00; Felix in the oven and Road Kill on the barbecue rotisserie. 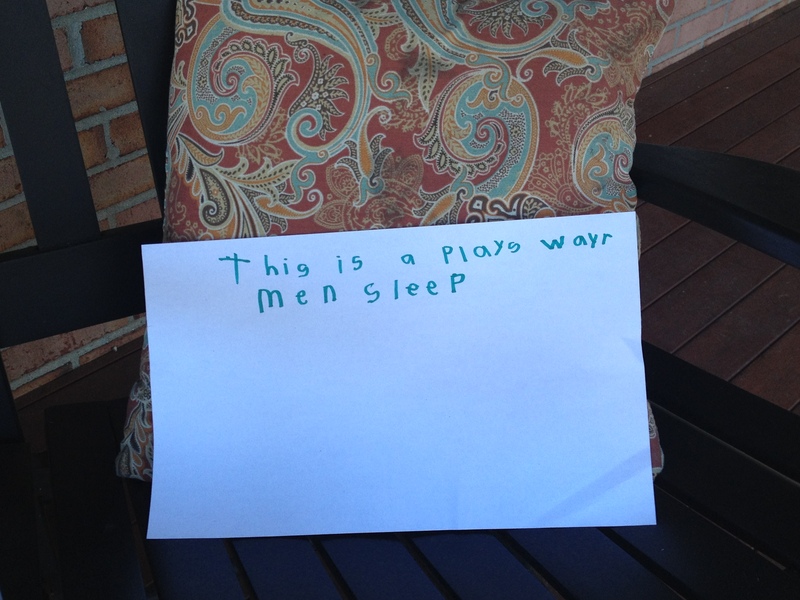 Just before our guests arrived, Joe wandered out to the front porch and found a note seven-year old Charlie left on one of the rocking chairs. Joe accused me of putting our son up to writing it, and honestly, I was offended. I mean, the message demonstrated copious amounts of wisdom, but the spelling? Atrocious. Eventually all of the aunts, uncles, cousins, and grandparents trickled in, and we enjoyed an afternoon of appetizers, cocktails, and fun. Throughout the festivities I checked on Felix, adjusting his tin foil cape and making sure he was basted. At exactly 5:00, Joe’s beast was done, but Felix’s timer stubbornly refused to pop. 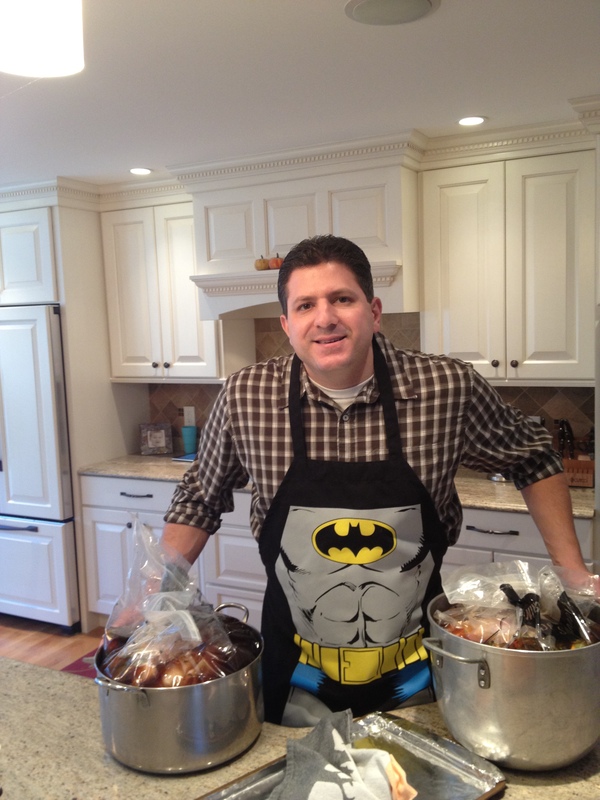 Dressed in a Batman apron, Joe carved Dried and Ugly. His mother gallantly asked for a leg off his turkey, and I loudly assured her she’d eaten her last meal at my table. She smiled widely and pushed her plate closer to accept the meat. Traitor. At long last, twenty-five Cariello’s commenced to the table for the traditional meal. And in the midst of all the chaos, I heard Jack’s robotic voice, “No. I will sit with my cousins. I will move.” And wonder of all wonders, Jack moved his own place setting from the island to sit with his brothers and older cousins at the large table in the family room. We watched in amazement as he smiled and giggled at their jokes and banter. During dinner our guests declared a tie between Felix and Unsavory. They chuckled good-naturedly and said that both turkeys were delicious, they couldn’t possibly pick a winner. Pansies. And then, just like that, the meal was over. We rose from the table, groaning over our fullness, and began to clean the kitchen and pack up the leftovers. Ann Marie motioned to me. Silently, she used the silvery tip of my brand-new Cutco knife to point out the place where Felix’s plump thigh joined his body. It was purple and shiny. It was undercooked. In that moment, Ann Marie’s dark eyes bore into mine, and a message passed between us. This message stood for sisterhood and loyalty and allegiance. It said we are now in this together and we will take this secret to our graves. Without a word, I held the large black Hefty bag open and she slid his carcass into it. No one was the wiser. On her way out, my mother-in-law grasped my arm with her leather-gloved hand, and whispered, “Your turkey was better. Juicier.” I smiled benevolently and accepted my praise with dignity and grace; I couldn’t bring myself to tell her that in a few short hours she may very well be hunkered over what my Italian father-in-law calls the terlet bowl, sick from salmonella poisoning. I wanted to hold on to my victory for as long as I could. Just then, Jack ran to where we were both standing by the door and shouted, “Grandma. Don’t GO. It’s not time to leave. Her face opened in surprise and she pulled him into a tight hug. I guess there was more than one victory this Thanksgiving. Joe and the competing turkeys. Great to hear about the changes in Jack! As I’m laying out the book I’m rereading as I go so this becomes more meaningful. And…you should have called me to take the carcass away. I got lucky and made the most incredible stock from the turkey breast I had to work with. I could perform the same magic and share the results next year. If you’re up for that. I’m always up for turkey magic! Can’t wait to see the layout. Hi Carrie – I have been thinking of you since Thanksgiving – Great post, by the way! But how was your tea? Worth every penny, I hope??! And did you wear your beautiful new sweater? I hope it really was a wonderful day for all of you (undercooked turkey aside!). Tea is great, I enjoy it on cold afternoons like tihs one. And I love the sweater too. Boots are also a new favorite! Hope you had a great Thanksgiving.